Name : Law Office Of Ronald D. Weiss, P.c. The Law Office of Ronald D. Weiss, P.C. is a bankruptcy, foreclosure, and modification law firm located in Bohemia, Suffolk County. 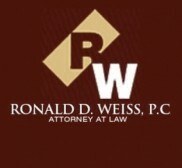 The Law Office of Ronald D. Weiss. P.C. concentrates in bankruptcy (Chapters 7, 13 & 11), foreclosure defense litigation, and mortgage loan modification solutions. Our law firm has represented many individuals and businesses experiencing financial hardship and mortgage difficulties in the Suffolk County and New York areas. Through advice and representation, our attorneys help determine and implement the best and most affordable ways to: eliminate overwhelming credit card obligations, reduce burdensome mortgage payments, stop creditor collection actions, and overcome foreclosure difficulties. The legal team works to defend and protect the rights and best interests of clients undergoing financial hardship with strategies designed to match their objectives.